From November 13-19, Cosmin Andron and Cristina Pogacean shared some photos and stories with the #alpinistcommunityproject. They are two Romanian alpinists. Cosmin is a former philosophy professor turned full-time mountain guide while Cristina is a civil engineer who also moonlights as a certified mountain guide. Brought together by a route in the Carpathians, the couple vacations together, choosing tents for suites, ledges for beds and hail for showers. Cosmin explores the not-so-obvious resulting pleasures in his essay, "Untracked," in Alpinist 56. More of his stories can be found at cosmin-andron.com. "Like most first ascents we tried, this one of Gandharva Chuli (6248m) in Annapurna region was also an improvisation act, so we were prepared to expect the unexpected. Nevertheless the mountain regaled us with a mighty electric storm that lasted from lunch to dinner and through the night to breakfast. All the pointy metal bits we were adorned with made the party quite electric. 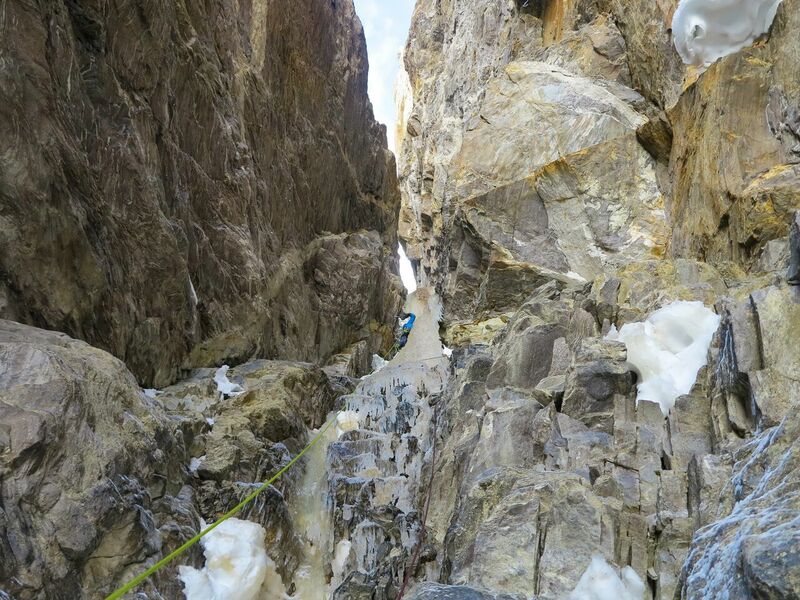 Here I belay Cristina on one of the mixed pitches during Day 1 just as the show was starting." "Cristina belays me across the West ridge of Gandharva Chuli (6248m) in the Annapurna region during the first ascent of the peak in May 2013. From afar this ridge looked extremely aesthetic, but when we got there it was sketchy and interminable. It was a balancing act on iron-hard blue ice under a dusting of snow followed by knee-deep powder. The ridge made every possible turn and rise and drop all the way to the top. Why we loved it is for the modern medical science to determine." 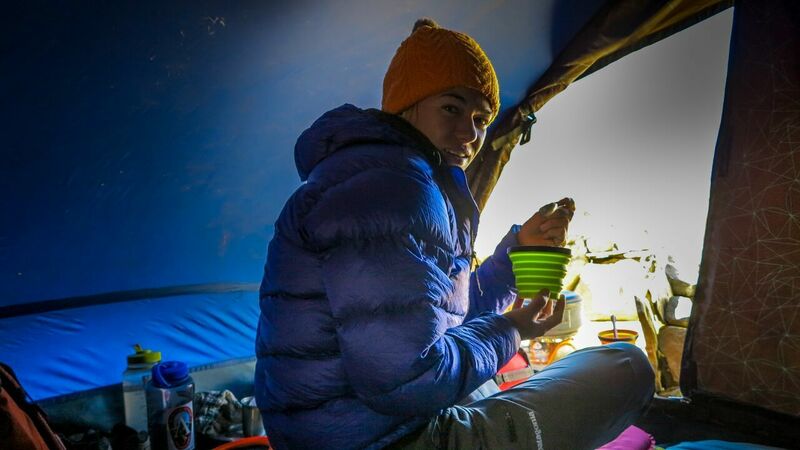 "Cristina enjoys a mug-full of chicken soup on the Kirti Bamak Glacier, India, after we set up camp in the middle of the moraine. The porters had left us, and we were miles away from our original climbing objective, for which our permit was already paid in full. The next day, on the Southwest Face of Bhagirathi I (6856m), life seemed much better since it could not have gone much worse under a volley of rocks and ice." "Cosmin leads the main icefall pitch on Day 2 of the 'Supercouloir' on T16 (6431m) Zanskar, India. 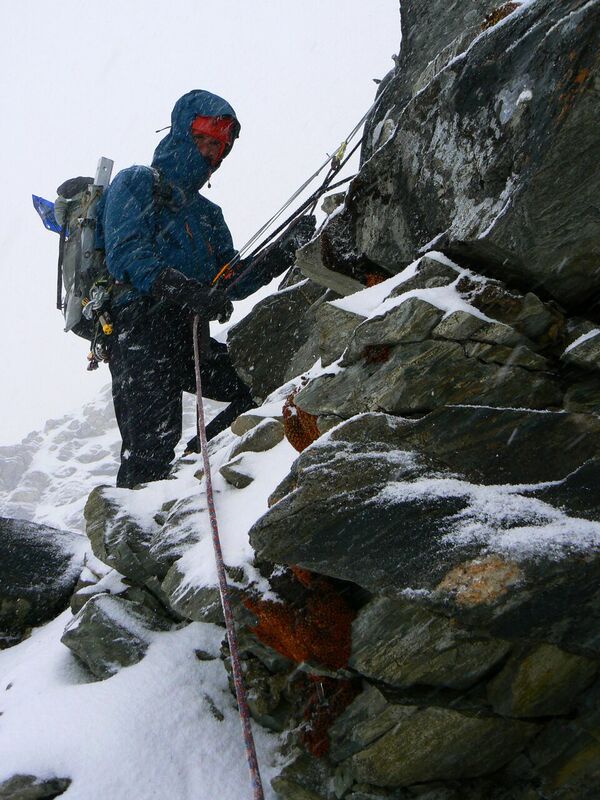 In Alpinist 56 he wrote, 'The ice was old, brown and thin, but at least it was brittle. I felt as though I were trying to capture a crocodile, hugging every bulge of frozen mud and pulling blindly on tools sunk in granite dust until I managed to clean most of the sliver of ice onto the belay below. I judged the damage to be minor by the quality of my wife's growl. Not the prettiest start of a day, but heaving and grunting gets you a long way if you're persistent.'" 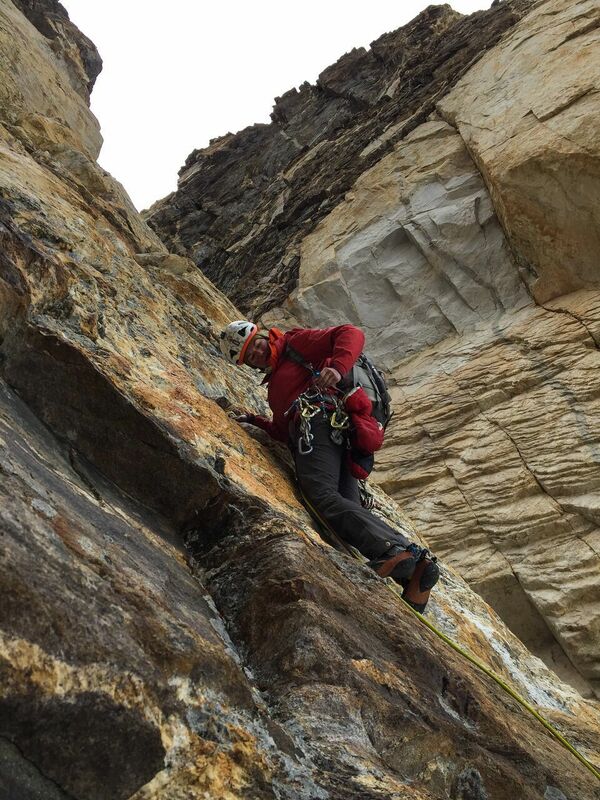 "On Day 3 of our first ascent of T16 (6431m) in Zanskar, India, Cristina enjoyed leading some of the most pleasant rock climbing the two of us ever had in the big mountains. This trip was perfect in so many ways: first we managed to make it cheap enough to afford; it was with a bunch of amazing friends and a dog; we managed to get to the actual mountain and found the perfect line; and last but not least we got up and down in one piece (hard to believe sometimes). We could not have asked for more. It was Christmas in June!" 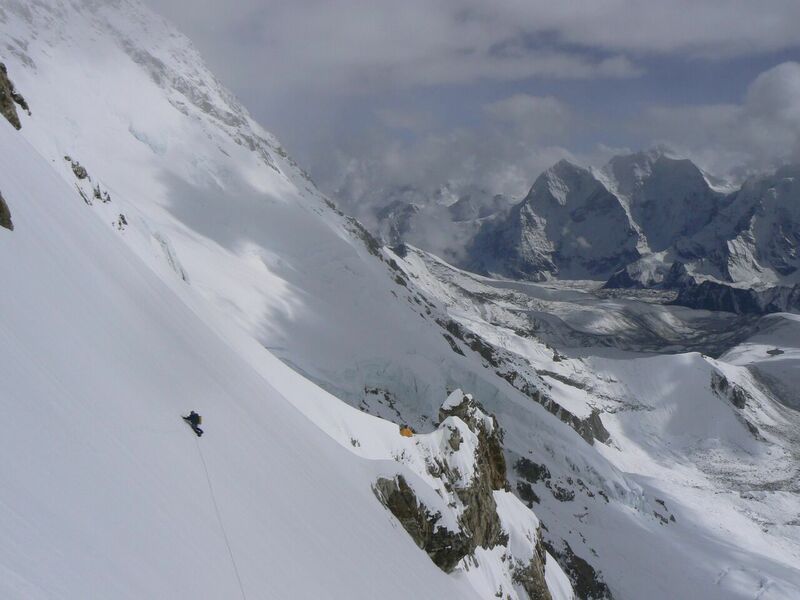 "In 2011 Wai Wah 'Geordie' Yip and I had a very convoluted thought process that ultimately led us, together with Cristina, to attempt pushing a new line up the Southwest Face of Shishapangma (8013m) in Tibet. Not hungry for the Slovenian or the Korean routes, we sneaked in between them. We had only a small weather window after unforeseen setbacks that included a search and rescue. We got totally boiled in our down suits and watched our only tent bounce off into the abyss in slow motion. 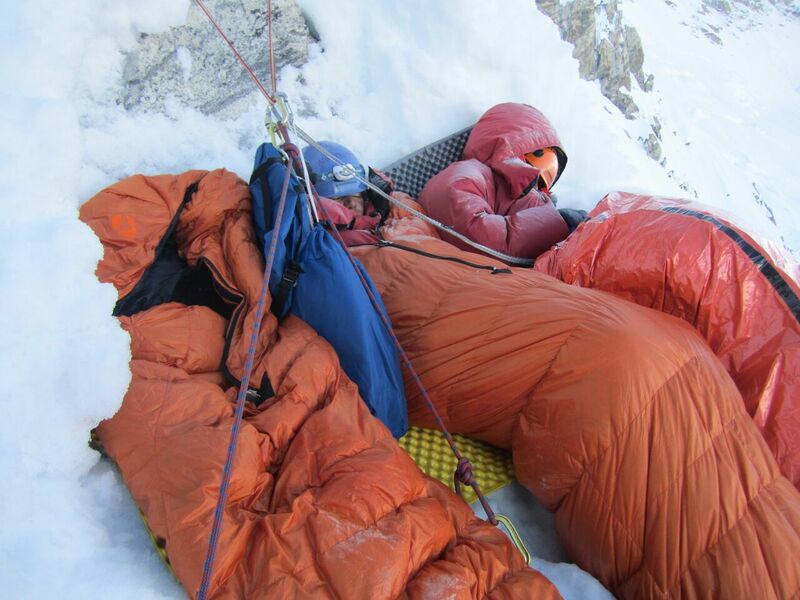 We also lost one of our ropes by accident and then managed to escape a storm, bailing from just above 7000 meters." 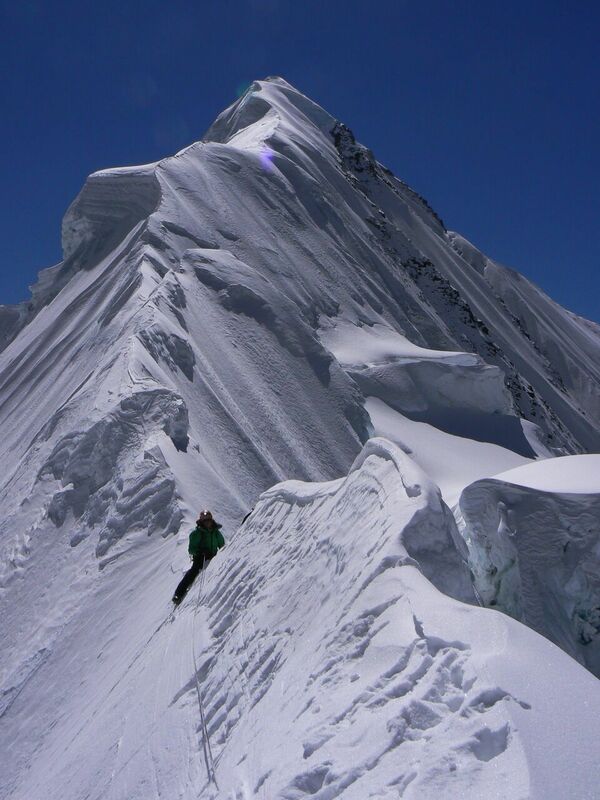 "One of the smarter decisions we made up on the Southwest Face of Shishapangma (8013m) was 'The bailing.' Here Wai Wah 'Geordie' Yip is traversing towards the British route and the Korean camp upon hearing that a snowstorm was upon us. He is trailing a rope behind him for the simple reason that neither Cristina nor I wanted to carry it anymore. We all thought it to be safer to go across solo and fast than to tie in together to cross this sketchy soft section in midday. Another story about Andron and Yip can be found here.